Bringing convenience directly to your collection, this three pack of disposable tanks are going to give you all of the flavor and cloud production in a much easier and stress-free form. If you have never had the pleasure of using a disposable tank, you are really going to be pleasantly surprised by how they are able to simplify your routine and allow you to focus on all of the fun that vaping has to offer. Sikary USA makes some absolutely stellar vaping solutions that are going to make a splash on the vaping industry with their unparalleled innovation. The Nunu Mate Disposable Sub Ohm Tank has a top fill system, mesh coil build, has a 0.15ohm rating and can handle 40-60W. The future of vaping has arrived and it is just as glorious as we all thought that it would be! 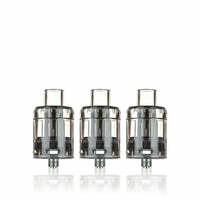 Nunu Mate Disposable Sub Ohm Tank (3 Pack) - Sikary USA has a rating of 1.0 stars based on 1 reviews.